REUTERS/Kevin LamarqueU.S. 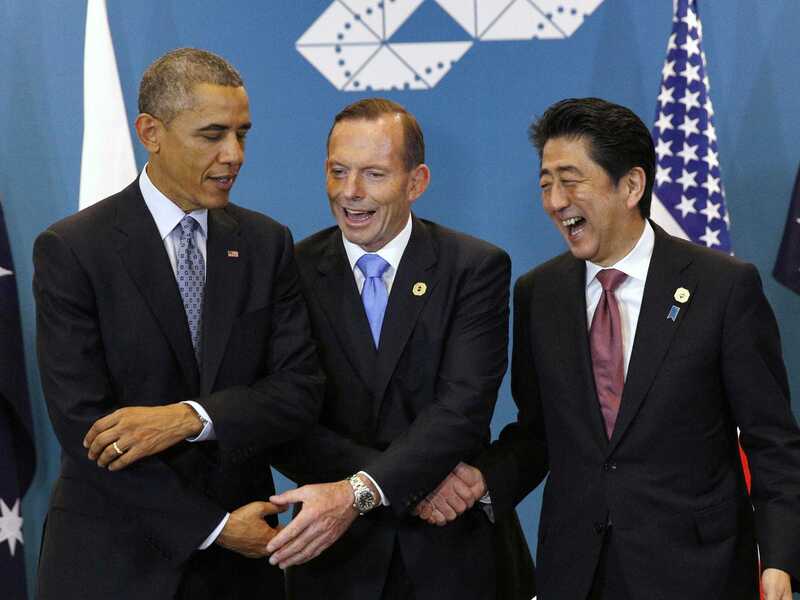 President Barack Obama, Australian Prime Minister Tony Abbott and Japanese Prime Minister Shinzo Abe meet at the G20 in Brisbane November 16, 2014. It was a quiet start to the week for the market, but by virtue of a higher close, the S&P 500 again made an all-time closing high, topping 2,040 for the first time. Stock futures were lower overnight after Japan’s economy unexpectedly fell into recession in the third quarter, but US stocks shook off these losses and closed the day mixed. 3. The biggest story on Monday was the announced merger between Irish pharmaceutical company Actavis and Botox-maker Allergan. Actavis will acquire Allergan in a cash and stock deal that values Allergan at about $US219 per share in a $US66 billion deal that ended Canadian pharmaceutical company Valeant’s pursuit of Allergan. Valeant had been pursuing a combination with Allergan as part of an effort the company undertook with hedge fund manager Bill Ackman. 4. Ackman is still a big winner on the deal, as Ackman acquired a 10% stake in Allergan as part of his effort to acquire the company along with Valeant, and according to Business Insider’s Julia La Roche, this position has seen Ackman reap a profit north of $US2 billion. And for Ackman, who has had just a huge year in 2014, this deal is what BI’s Linette Lopez writes is a classic example of Wall Street’s old “Heads I win, tails you lose” value proposition. Following the news, shares of all three companies advanced, with Allergan gaining more than 4%, Valeant gaining about 2%, and Actavis adding more than 1%. 5. Also in deal news on Monday, oil services giants Halliburton and Baker Hughes will merge in a $US34.6 billion deal that sees Halliburton acquires its smaller rival in a deal valuing Baker Hughes at $US78.62 per share. The announcement follows news late Friday that the deal might be falling through, or that Halliburton would have to make their efforts to acquire Baker Hughes a hostile takeover. 6. Another big stock mover on Monday was DreamWorks Animation, which saw shares fall more than 14% after reports over the weekend said the company’s merger talks with toymaker Hasbro fell apart, leaving DreamWorks without an acquirer for the second time in about six weeks. A notable gainer on Monday was Tyson, which added more than 5% after the chicken giant’s quarterly profit topped expectations. 7. The crucial Holiday shopping season is fast approaching, and in an email circulated on Monday, Deutsche Bank economist Torsten Slok noted that an increase in retail hiring in October, which is when retailers beef up for the Holiday season, could be indicating a strong season ahead.